It can be called Caesarea Maritima or Caesarea Palestine. It's half way between Tel Aviv and Haifa on an ancient site that was later occupied by the crusaders and was forgotten since the 13th century. In 1950, archaeologists rescued this port city founded by Herod with Roman support from oblivion. Built on a Phoenician port, it was named after Caesar. Herod converted it into the largest port in the east, giving the city roads, aqueducts, and making it the capital of Judea. St. Paul was imprisoned here in 58. It was an intellectual center in Byzantine times, and the Crusaders used it as a port city. Qesarya is an important Israeli archaeological site. 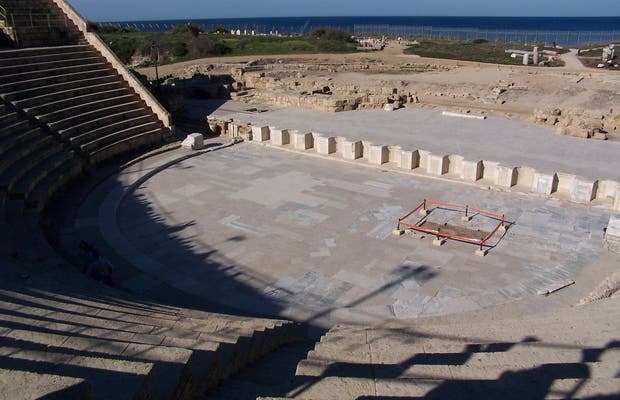 Located halfway between Tel Aviv and Haifa, the site tells the story of Israel during the time of Emperor Caesar in the year 20 AD. There are temple ruins which we can only imagine as being magnificent. A guide, in my opinion, is almost indispensable so that you can understand what you are looking at. There are magnificent mosaics, still in perfect condition. However, think about bringing bottled water if visiting in summer because it is very hot (40 degrees in August).